Notes: It’s the final count down five days left of my FitnessBuilder review! I am picking up where I left off last week with the Dumbbells, Level 3: Comprehensive , Workout 9. One of the things I like about FB is it’s ability to adapt to my needs. The application keeps challenging me with harder workouts. 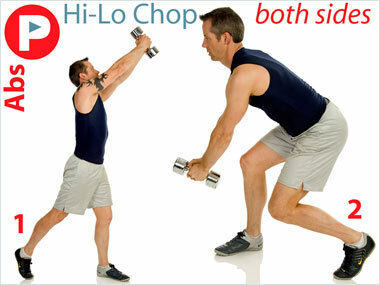 Exercise of the Day: Hi-Lo Chop ab exercise. Simple motion that has great burn, a must try. You can also do this exercise with a medicine ball and cables. The FitnessBuilder Dumbbell series will push, pull and mold you in unexpected ways. Summary Dumbbell, Level 3: Comprehensive Workout. You don’t need a full gym to get a good work out in. A set of the Dumbbells and a free standing bench is all you need to get fit.